"OK, if I can get my waterproofs on without throwing up, then I'll try for the summit". We are at the Gouter Hut (3,800 meters above sea level) en route to the highest point of Western Europe, Mont Blanc (4,810m). The previous day myself, Dave, my 30 year old business partner and marathon runner and I had been marched Napoleon style halfway up the mountain. 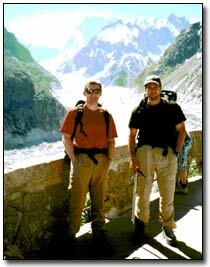 We were now suffering quite badly from altitude sickness, hence the severe headaches and nausea and decision point. We had essentially gone from sea level to 3,800 meters above sea level in 6 hours. We assumed our Guide would ensure we were properly acclimatized. In hindsight, we had clearly relied on him far too much. The previous day had certainly been eventful. We had set off from Chamonix and arrived at the start of the climb after taking the cable car ( or telepherique) from Les Houches to Bellevue and a tram to Nid d'Aigle (2386m). 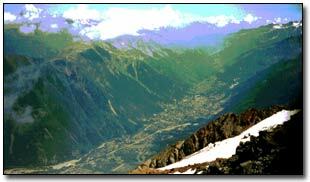 The Gouter route had been chosen because of its lower avalanche risk than other routes. However, it held a nasty obstacle in the guise of "The Grand Couloir", an almost vertical corridor that ran down the mountain and had to be crossed to continue the route. I had seen a description of the Couloir previously that likened it to " a bowling alley, except you are the pins and the bowls are gigantic boulders dislodged by melting ice that come hurtling down the mountain at you." In our panic to get across (which was mainly caught from the panic of our Guide who seemed certain that he would be hit!) Dave's crampon came off. Thankfully the Bowling Gods spared us and we made it safely across. That evening at the Gouter Hut I noticed a woman peering and pointing at me across the room as I tried to force down yet another litre of water to reduce the effects of altitude. She was obviously concerned and it must have been obvious to her that both Dave and I should immediately descend to a lower altitude if we were to avoid more serious illness. Unfortunately it was less obvious to we inexperienced Alpinists and we decided to stick it out. At 3am, after an uncomfortable night spent in a room full of more than 30 other snoring men, sleeping with less than two feet of space to myself, it was decision time. Dave, still suffering a cocktail of Trans-Atlantic jet lag and altitude sickness made the right decision in hindsight and decided to forego the summit attempt. I somehow managed to get my waterproofs on without losing my breakfast. Assuming that I would get no further than two minutes from the hut and then be forced to return with altitude sickness, I decided to give it a go. Commencing the summit climb, the scene that met my already dizzy eyes was startling. All around was a dreamlike blanket of pure whiteness, covered by a dark blue ceiling pin pricked by twinkling stars. The moonlit peaks in the distance seemed close enough to touch through the crystal clear air. Ahead on the mountain I could see groups of lights snaking their way higher and higher up the mountain. These were the head torches of fellow climbers covering the steps that I would soon follow. Whether due to the astonishing views, or the fact that my body, now moving, was adapting to the altitude I started to feel less nauseous. In fact, as the hours passed I began to feel increasingly better. The rhythm of switching ice-axe to the inside hand at each turn and avoiding standing on the rope with crampons, was making me feel better with each step. We were now two hours into the climb and approaching the Col du Dome (4,240m) just before the final ridge to the summit. It was starting to become brighter now, and suddenly, as we reached the flatter slopes of the Col.
Bang - the world suddenly turned gold! The sunrise over the eastern peaks ricocheted and spread over the entire landscape, turning the grey-white of dawn to a shimmering gold. Long shadows were cast west by the climbers, pointing towards similarly astonishing views watched over by a full moon still high in the sky. I turned South East towards our remaining route along the Bosses Ridge. It looked as frightening as I had previously read. The ridge is a narrow razorback with long sheer drops on either side, and climbers scramble past each other on ascent and descent. Many climbers are infamous for their lack of manners and concern for their fellow mountaineers in such a dangerous place, making it all the more hazardous. Someone else clearly felt the same as I passed newly formed patches of vomit outlined starkly against the snow. 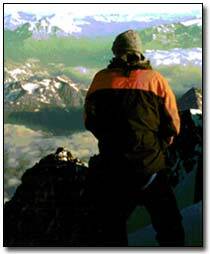 There, on the highest point of Western Europe, a man was urinating off the side. A surreal sight for me, Europe's most scenic restroom for him! I didn't have time to establish whether this was a statement he was making or just the call of nature, for once again the Guide was urging me off the mountaintop. Perhaps he could see his TV from where we stood. Although I had less than a minute on the summit, the views (with the exception of our urinating friend of course) were nonetheless fantastic. As my first experience of Alpine climbing or any summit over 4,000 meters it was an experience that I will never forget, no matter how hard the Guide worked to ruin it. Let's hope he has a new job now!